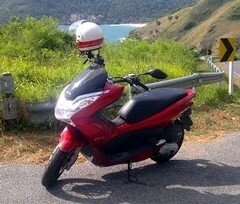 Finally my dream is coming true and I go on a trip with my faithful Scooter from Phuket via Bangkok, Pattaya, Chantaburi to the North-East - Ubon Ratchatani, Mukdahan, Sakon Nakhon, Nakhon Phanom, then following the mighty Maekhong River to Nong Khai. The way back to Phuket will take me to Loei and Ayuttaya, then via Kanchanaburi and Ratchaburi down South, from Chumphon going west to Ranong and along the coast down to Phuket again. The whole trip will be about 4,000 km, take about 3 weeks, and I hope it will be great fun. On the way I will be joined by some friends from Nong Khai, but whoever is heading the same way on a comparable scooter and is willing to blend into the party, join us! Pictures will be uploaded along the trip to hondapcx.org, after the trip I will set up a gallery here. To follow the trip live, click here to follow me on Glympse.